What neither of us noticed is that he had 2 different shoes on. 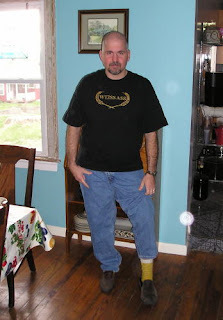 By then end of the day, instead of "that guy with the cool beer socks," he was known as "Two-Shoes." Sigh. Valiant effort on my part, though. I have to amend my earlier critique of the socks - I didn't redo the ribbing in a larger needle, and although they were TIGHT, they did fit over his foot. I don't know if this will relax with wear, but since they're major novelty socks (and not everyday), I'm not concerned. They're done. I'm on to better things. Like finally blocking Clappy. Good lord. She could put somebody's eye out! Ummm... I'm willing to sacrifice an eye just to see if that would be possible! Stop it, people! This is a family show!